Growing up as a kid I was lucky because my father would take me fishing most every weekend during the summer. I fished with all types of reels and got experience using spinning, baitcasting, spincast and fly fishing reels. Like most anglers I started out with a Zebco spincast reel and as I gained experience I moved on to other types. Each type of reel is meant for specific types of fishing and we’ll go over that in our guide. So if you’re looking for your first reel or just your next one, you are in the right place! Here is a feature overview of my top 3 overall picks. Our guide and comparison table of the top fishing reels will help you choose the right one. No matter what version of this gorgeous spinning reel you choose to go with, you’ll be happy with the performance. As one of the top rated popular spinning reels on the market right now, the Summer and Centron reels have earned their place. I personally love the night and day contrast of the Centron’s dark color theme against the Summer’s light colors. Either one you pick is available in 4 different sizes that each fit a slightly different task. The 2000 and 3000 models are good for smaller game fish. They feature the faster 5.2:1 gear ratio. Meanwhile, the 4000 and 5000 models rock the slower, beefier 4.5:1 gear ratio. These are ideal for large mono line and braided line to haul in the big ones! While it’s hardly revolutionary, the machined aluminum spool seems like a good fit. Graphite body components and aluminum spooling keep the reel lightweight while steel drive gears provide the power to land large fish. Best For: A reliable spinning reel available in any size to fit your needs. 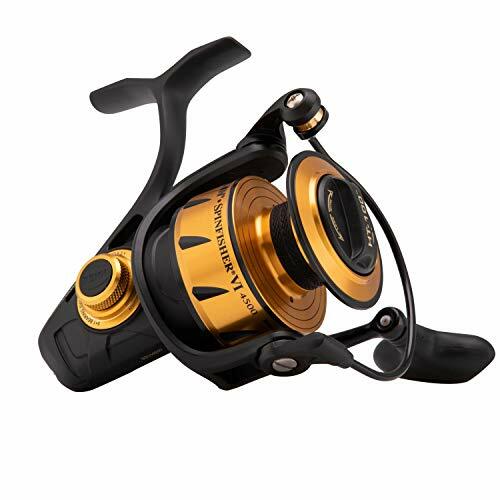 While the KastKing reels offer some variations, nothing compares to the Battle II reel by Penn. This reel is offered in no less than 8 different models each of which has a specific purpose and ideal fishing conditions. Penn’s Battle II reel is made to target saltwater species with precision. The metal aluminum body, spool, stainless bearings, and carbon drag disc all perform well in the harsh conditions of saltwater fishing. Honestly, I think this reel is one of the best spinning reels for handling large game fish in saltwater locations. The spool has markings at ⅔ and ⅓ to let you know how much line is left when fighting a big run. The carbon fiber drag system is also way better than the traditional felt disc drag at handling large loads. Some anglers complain about composite frames and bodies on large reels. Why? Because fighting big fish can cause softer bodies to bend. The Battle II is an all metal body which helps to work around the issue of deflection and bending. 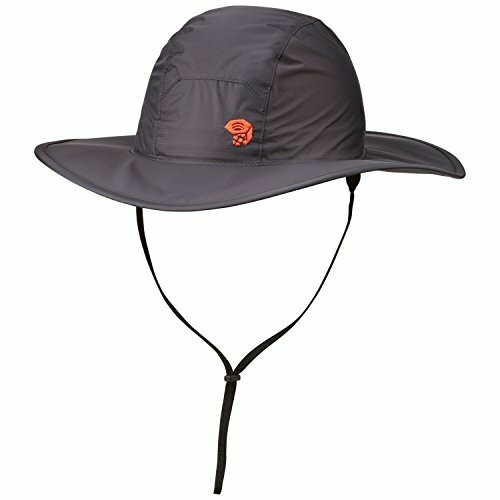 Best For: Going after large game fish in harsh conditions. These guys have been making fishing gear for decades and their BG models have only expanded and improved. There’s a specific reel for everything from lightweight freshwater fish to huge saltwater fighters. There are no less than 10 different models of the BG reels. Each one is tuned to a very specific gear ratio, drag limit, and line return rate. No matter what area you’re fishing and what your target fish is, there’s a reel here ideal for your needs. I personally like the aluminum body construction. It’s a bit heavier than graphite, but it’s more durable and robust. Daiwa tunes the interior gears with a Digigear system that’s designed and machined with digital precision. Best For: A single model of reel that can handle any fishing situation. To see all my recommended spinning reels, see my reviews here and spinning rods here. Piscifun seems to just keep producing sweet fishing gear at insanely good prices. The Torrent baitcasting reel is another solid performer that users just fall in love with. Baitcasting reels are notorious for backlashing and making a royal mess out of your line. That’s why the magnetic adjustable backlash settings (0-10 on this reel) are a must-have. Internally the brass gears a really solid choice for saltwater use. They are almost impervious to oxidation and plenty strong enough to handle any fish you’ll land with this reel. One of the most unique features of this reel is the side plate oil hole. This makes it easy to lube and maintain your reel even as a complete novice. It also makes an opening where dirt and debris can get it, so there’s always a tradeoff. Best For: An affordable, solid baitcasting reel that’s foolproof for every level of angler. The most striking feature of this baitcasting reel is the Cadillac-esque design and styling that captures the eye. Beyond that, however, is a pile of high end features packed into an affordable reel. Unlike some of the spincasting reels, this baitcaster is only available in a single model. That’s okay though because it just keeps everything rounded out in an easy to use package. I love that they packed in high end features like 12 ball bearings for a smooth action and magnetic brakes to control backlash. I would have honestly liked to see a 3x carbon washer drag system, but 2x is usually just fine so I won’t ding it too much. Besides, it’s hard to go wrong when your reel is well-loved by uncounted thousands of users. This is one of the most popular reels on our list! 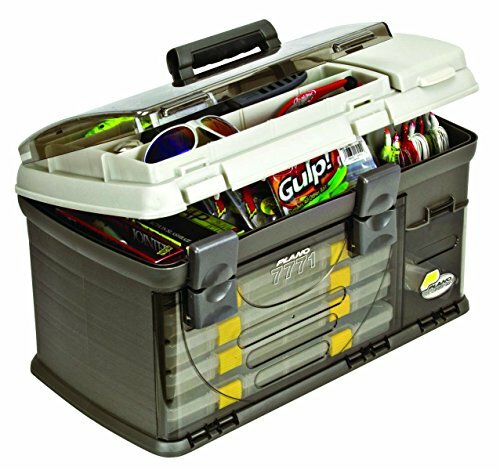 Best For: Top quality features when fishing medium to large game fish. This reel gets top marks for being one of the slimmest, most low profile designs we’ve reviewed. Plus, the emphasis on small and light is reinforced with a fully graphite frame and body. 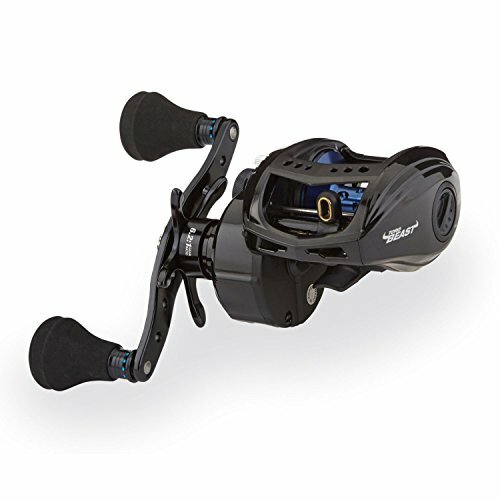 Unlike other reels, baitcasters cannot be switched from left to right hand on the fly. You must make sure you purchase the correct hand when you order, so be sure to double check! Luckily this one comes in either side! I love that the low profile reel is further slimmed by the bent handle reel system. The handle is dropped down to the side of the reel to keep the entire setup low on the rod. While 5 ball bearings is less than other models, it’s still plenty to get the job done while remaining smooth. Honestly anything more than 5 can seem excessive to many anglers. 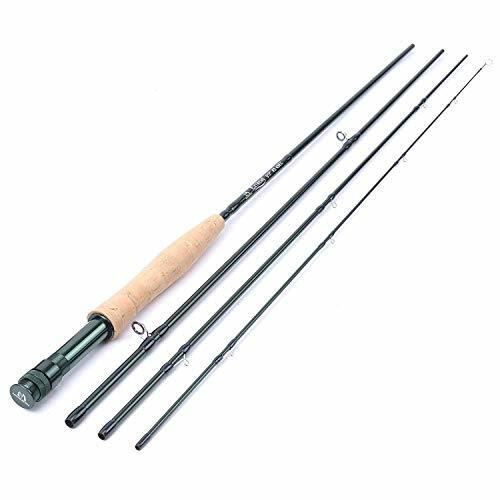 Best For: A graphite frame, brass gears, and stainless steel bearings rod great for small fish in both freshwater and saltwater. To see all my recommended baitcasting reels, see my reviews here and baitcasting rods here. It doesn’t get much more classic than the Zebco 33 reel. Zebco invented the spincasting reel and they’ve mastered it over the years. Today’s models are simple but refined. It might not seem like a big thing, but the simplified clamshell packaging is cheaper than retail packaging. It also produces less waste for landfills and dumps. For that reason this reel gets a major ethical thumbs up. It’s also hard to beat the foolproof use of a spincasting reel. With a dual thumb knob handle, anti-reverse, and an easy to use drag system you can’t go wrong. Bite alert settings are easy to turn on or off. 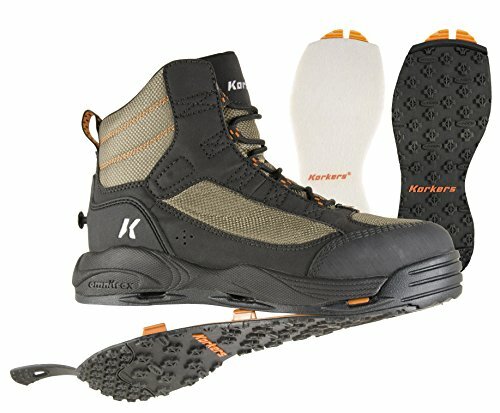 I don’t use them myself but they may be helpful for beginners. 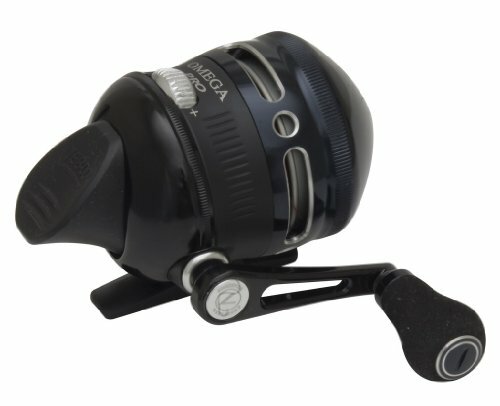 With bite alert on the reel makes an audible feedback that helps you remember to set the hook! Best For: A simple, inexpensive, and reliable reel from the leader in spincasting. Daiwa has one of the most recognizable spincasting reels out there. This one is small, compact, and sports a clean black and gold look that belies its effectiveness. While the Zebco 33 we reviewed above has a plastic body, the more pricey Daiwa Goldcast rocks a full metal body. Not only that, the gears and cone are also solid metal. There’s nothing cheap about the build quality on this golden reel. I also love that the cone has the line size and capacity written right on there. That way you don’t have to go digging around in the manual to remember gear ratios, capacity, and other info. This reel is rocking a 4.1:1 gear ratio. That’s a relatively fast retrieve but still moderate enough to make small fish fun or big ones manageable. 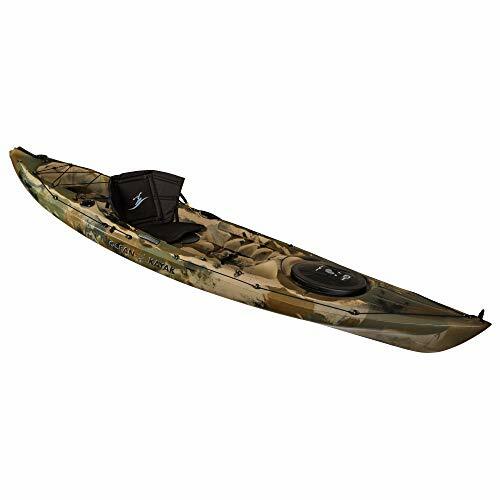 Best For: A one-reel quiver that can handle just about anything and is very easy to use. To see all my recommended spincast reels, see my reviews here. Piscifun just never seems to stop making great fishing reels at amazing prices. How they do it is beyond me. However, what we get is an amazing fly fishing reel that’s going to be able to take care of the middle ground. When it comes to fly fishing reels, there’s no shortage of options. Everyone wants something slightly different. 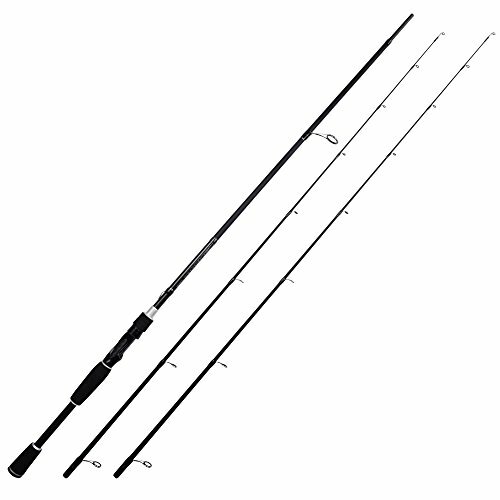 However, this mid-arbor design is pretty ideal for a broad range of fishing. Mid arbors balance line capacity with retrieval speed. Users love this reel because it’s affordable but machined to tight tolerances. There’s little or no wobble or play in the reel. The cork and stainless steel drag is smooth from the factory and stays that way. I also have to say that I like the anodized aluminum both for aesthetics as well as practicality. Anodization is a durable, tough surface that will stand up to years of use. Best For: A one-reel quiver fly fishing reel where you need a balance of line capacity and speed. I chose this one because it’s an affordable and well-loved large arbor design. They also made it just look good like old leather and fine whiskey. Plus, they’ve improved the materials in the new model. I have to say that they did a good job making this reel look sleek, yet nice without overdoing anything. Compared to the bold colors of the Piscifun it’s a little more subdued. Of course, colors are not the most important factor of a fishing reel for most people. In that regard, I will say that the reel isn’t revolutionizing the design or materials of fly fishing reels. Aluminum is, nonetheless, a great material choice that’s lightweight and inexpensive as well as corrosion resistant. 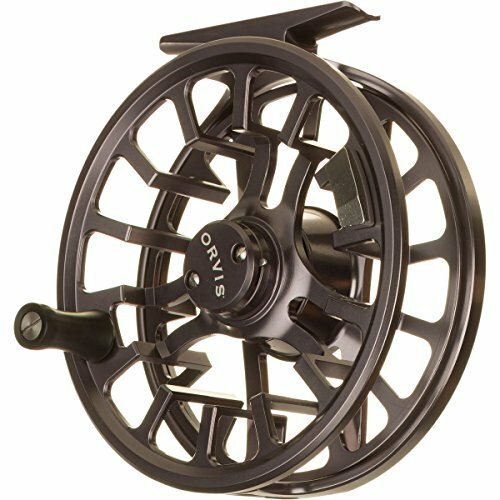 This reel sets itself apart by focusing on a large arbor design. Large arbors don’t have as much line capacity as other reels. However, they retrieve quickly and keep the fly moving. That means less reeling and better action for flies that need to move rapidly. Best For: Less work reeling or pulling in smaller fish quickly when working a fast fly. To see all my recommended fly fishing reels, see my reviews here and fly fishing rods here. There is an ideal reel for each person, each fish, and each situation. That makes it almost impossible to figure out the exact best one! So, what’s to do? Let me help you understand how to narrow down your choice. Beginners will often start with spincasting reels. These reels are dead simple to use and relatively effective. Many complain that they kink or bend fishing line over time which is true. However, because of their ease of use they offer a lot to the beginner. Intermediates may go in just about any direction. Often the perceived pressure is to move away from baitcasting reels. However, that’s not necessary as many intermediate anglers choose to stick with the simple thing. Advanced anglers can choose just about anything. Baitcasters are good for speed and control. Spinning reels are great for lightweight bait. You’ll also want to consider your target species. There are several distinct reels on our list. I’ll discuss each one here in detail so that you can decide which one is ideal for you! They offer amazing control. They can handle a wide varieties of fish, locations, and skill levels. They are slightly prone to backlashing, however, which can make a mess of your line and is the biggest single drawback of this reel style. Don’t be afraid to learn baitcasting, though, as it is by far the most versatile. When baitcasting, control of the line is achieved by carefully adding pressure to the spool with your thumb. Many reels have advanced magnetic brakes which slow the spool down so that backlash is less common or avoided altogether. Baitcasting reels, with practice, can be very accurate for casting. They’re also available in many sizes and handle larger fish with ease. For a full assessment of spinning reels, see our in-depth article. These reels are the classic foolproof reel. These reels are so easy to use that they’re often called the “beginner” reels. Their biggest drawback is that they are hard on the line causing it to kink and bend over time. You can find spincasting reels in almost any size but small to medium freshwater species are usually more common targets for these reels. Spincasting reels are not always for beginners, however. Even experienced anglers use these reels thanks to their dead simplicity. They’re usually quite accurate and can be adapted to most situations. Consider keeping one on hand for backup, at the very least. Spinning reels are versatile and useful in just about any situation. They can fish freshwater or saltwater and come in many sizes. They’re often used for small, lightweight setups for fishing small or medium freshwater species. Spinning reels are ideal for lightweight setups. Lures without much mass can struggle to pull the line from other reels. With spinning reels the line just slips right off and you can get good distance on even the smallest and lightest tackle. Fly fishing reels are the most specialized on or list and of course, only for fly fishing. These reels are completely different from the others. Fly reels are awesome if you want to learn to enjoy the unique flavor of fly fishing which can be done in many environments. Most often fly fishing is popular for species like trout in small, secluded streams where the technique shines. Fly reels have several variations that are important to note. In our reviews I selected a mid arbor design and a large arbor design. Arbor size controls how much line the reel can handle and how fast it retrieves. Other characteristics can be selected based on which fly reel you choose. For a full assessment of fly reels, see our in-depth article. This one can be hard to narrow down. It’s possible to fish just about any species with any reel. 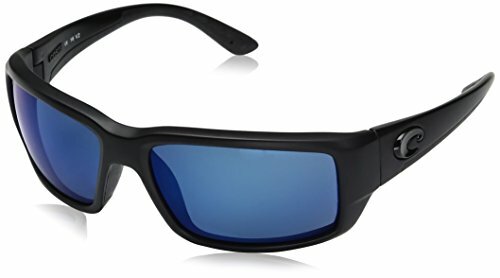 However, most anglers have a preference. Larger species tend to be easier on baitcasting reels. Because these reels handle larger line better, you can load up that reel with hard hitting line to land those Redfish. If you go up big enough they’re also solid choices for open water fishing. Medium to large species such as bigger bass and northern pike are going to be easier on baitcasting reels. However, they can be fun to fight on spinning reels. Spincasting reels can also easily handle these species. Smaller species are fun on spinning reels; particularly smaller spinning reels. Spincasting reels can handle these fish with ease as well. If you want you can use a small baitcaster because some prefer the control and speed for shallow water fishing in some cases. You need to pay attention to what kind of bait you’re using when selecting a reel. Research your target species and which bait or techniques work well on them. Then, pick a reel that can keep up. For instance, if you’re trying to work a bait across the surface to target bass you’ll need a reel with a fast retrieve. Using the wrong reel means you’ll be cranking furiously to get the speed you need and you’ll tire quickly or it just won’t work. Trying to keep a fast reel slow enough to work a bottom bait is a pain, as well. That’s why you may want a fast reel and a slow reel. As you become more experienced and gain more tackle and experience you can add more reels that will round out the middle of your retrieval rate. If you’re heading out after a very specific type of fish, be sure to do your homework. Having the right reel makes all the difference and often doesn’t cost much. Fighting with the wrong equipment to control your bait will leave you frustrated and hungry without any catch at the end of the day. Finding a beginner or “one-reel-quiver” isn’t so hard. You can pretty easily go with a spincasting reel to get started. Finding a moderate baitcasting reel or spinning reel will probably leave most anglers equally happy. The more specific your needs the more you’ll want to be sure to complete your homework! If you just want to get started and throw a lure into the water, it can be hard to go wrong. I hope this guide was helpful in picking the best fishing reel to fit your needs. If you want to comment or recommend a reel I didn’t include, please use my contact form to get in touch.